During my visit to St. Louis this past Memorial Day weekend, there wasn’t much time for a formal workout session, but I wanted to make sure I didn’t lose footing as I ascend towards mastering my bodyweight. With that in mind, I decided to get my reps in throughout the day anywhere and everywhere that I went. In addition to attending a few family functions, I hit up the usual tourist attractions like the St. Louis Zoo, the Missouri Botanical Gardens, Grant’s Farm and of course, the famous St. Louis Arch. Though I didn’t strictly adhere to a healthy eating plan while vacationing, I made sure to practice push-ups, pull-ups, muscle-ups, dips, L-sits and of course, the human flag. You don’t need a gym to get your workout in! 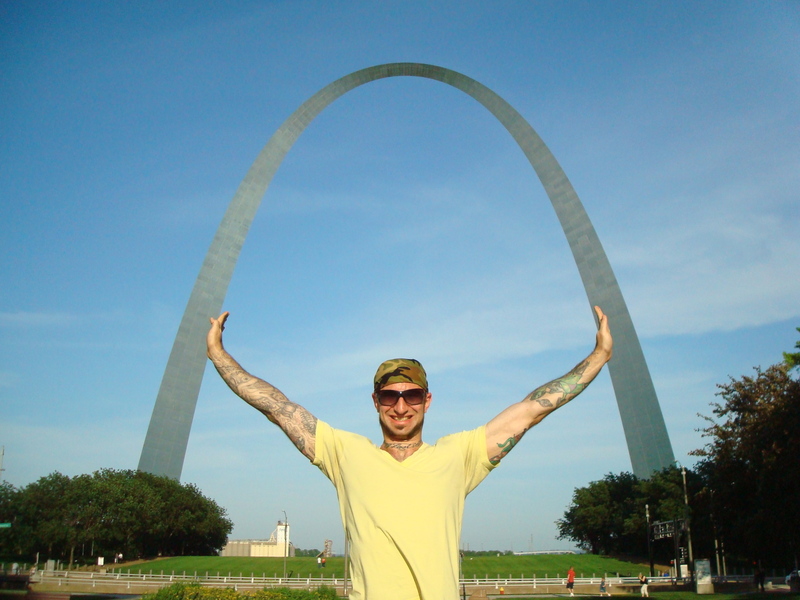 The human flag right by the base of the arch! Going to have to do the flag at all national land marks! Haha – one thing at a time! Glad you enjoyed this clip! My hometown and I was there this weekend. Wish I could have met ya there, it is a great place and lots to do. I had a blast in the STL! Maybe next time we’ll get to meet. LOVE this! No wonder I hardly saw you–you were busy getting in your reps! Thanks! Was nice to see you! Very inspirational! I love your good spirits, too. Glad to see you got a chance to do the human flag at the Arch. Thanks! And yes, I have heard of Ernestine Shepard before. She’s a great example of the whole “no excuses” philosophy. How you didn’t either become a member or get kicked out of the zoo is beyond me. Great video! I spent 3 hours last night reading your site. Inspiring….oh ya your brother aint too shabby either. Thanks, Chuck! Glad you’ve been enjoying my blog.